Janet Evanovich is the #1 bestselling author of the Stephanie Plum novels, twelve romance novels, the Alexandra Barnaby novels, and How I Write: Secrets of a Bestselling Author. She lives in New Hampshire and Florida along with her St. Bernard granddog Barnaby. Learn more at Janet Evanovich’s website. CLICK HERE FOR MORE BOOKS BY JANET EVANOVICH. Lizzy and Diesel — (2010-2012) Publisher: Life in Marblehead has had a pleasant predictability, until Diesel arrives. Rumor has it that a collection of priceless ancient relics representing the Seven Deadly Sins have made their way to Boston’s North Shore. Partnered with pastry chef Lizzie Tucker, Diesel bullies and charms his way through historic Salem to track them down—and his criminal mastermind cousin Gerewulf Grimorie. The black-haired, black-hearted Wulf is on the hunt for the relic representing gluttony. Caught in a race against time, Diesel and Lizzie soon find out that more isn’t always better, as they battle Wulf and the first of the deadly sins. 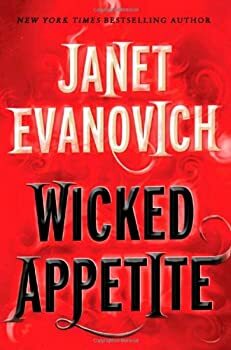 With delectable characters and non-stop thrills that have made Janet Evanovich a household name, Wicked Appetite will leave you hungry for more. Janet Evanovich is the well-known author of the Stephanie Plum mystery series, and here she begins another series that edges firmly into the paranormal arena. Elizabeth Tucker lives in Marblehead, just north of Boston, and makes cupcakes for a living while living in the house bequeathed to her by Great Aunt Ophelia. Her life is perfectly pleasant but very ordinary when two men walk into it and proceed to turn it upside down. One is Wulf and he is a Bad Man. The other is Diesel, our Alpha Male, who explains to Liz that she is an Unmentionable and has to help him search out the SALIGIA stones (named for the first initials of the Latin names of the Seven Deadly Sins). Wulf is also looking for the stones and so Liz is caught in a race against time to discover their whereabouts.